Wild cherry, also known as black cherry, sweet cherry and Virginian prune, is a species of flowering tree that is naturally distributed throughout eastern North America. Because the tree produces lovely pink clusters of flowers in spring and an edible stone fruit in summer, it is also popular in cultivation for food and landscaping. The bark is also harvested for use in smoking meats and fish. Wild cherry bark is also a traditional ingredient in herbal liquors, syrups, throat lozenges and teas. Prunus serotina is a flowering tree in the Rosaceae family. Wild cherry as the plant is commonly known, is one of the largest of the cherries and will typically reach heights of 50-80 feet—and less frequently even to 100 feet. It is graced with a narrow-columnar to rounded crown. The narrow glossy green leaves are oblong-ovate to lanceolate (to 5” long); they have acuminate tips and serrate margins. Its spring bloom is profuse; it has attractive summer foliage; and striking fall color. In the spring (roughly late April-May), fragrant white flowers appear along with the foliage in slender pendulous clusters (with racemes to 6” long). 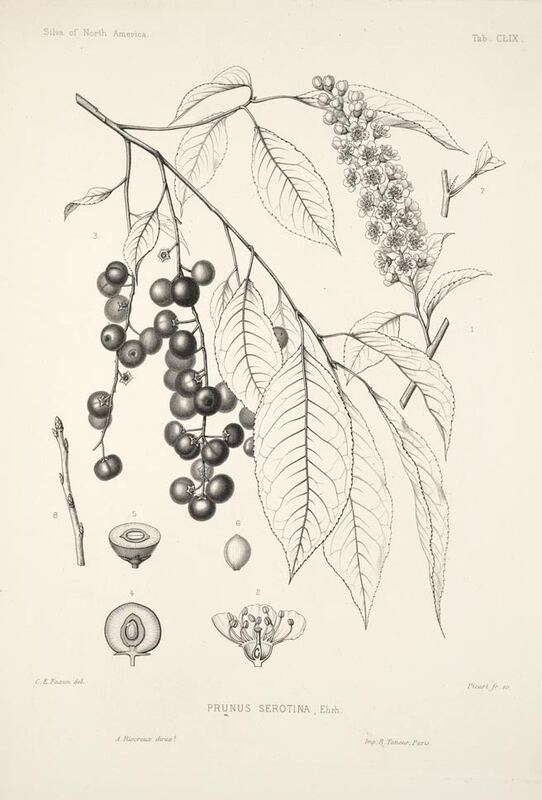 The tree's flowers are followed by drooping clusters of small red cherries (up to 3/8 inch in diameter). These ripen in late summer when they will turn dark purple-black. The tree's green foliage will turn to attractive shades of yellow and rose in fall. Mature trees develop dark scaly bark. Seed production will begin at about 10 years of age, but does not become heavy until 30 years. This production can continue up to 100 years. Specific epithet serotina is derived from the Latin word for “late”. 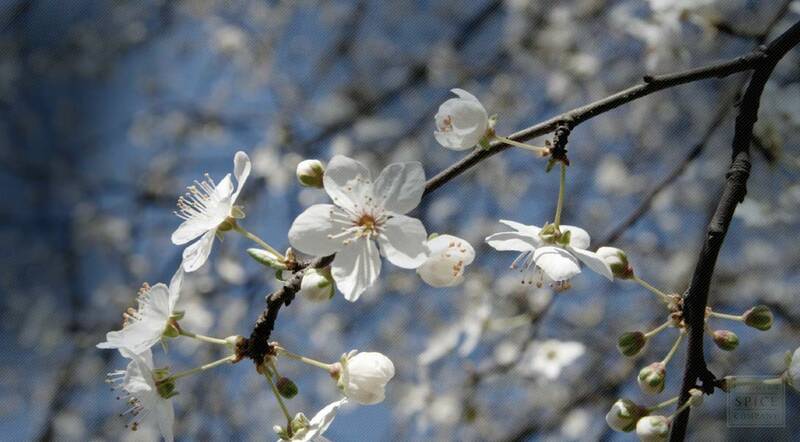 This moniker is in reference to this cherry tree's late flowering and fruiting in comparison to other cherries. Prunus serotina is native to eastern North America: from eastern Canada through southern Quebec and Ontario; south through the eastern United States to Texas and central Florida; with various populations in Arizona and New Mexico; and in the mountains of Mexico and Guatemala. Wild cherry grows in sunny fields, roadsides, waste land, and forest-margins. Occurs in both lowland and upland woods and along streams. Requires a well-drained moisture retentive soil. Seed requires 2 - 3 months cold stratification and is best sown in a cold frame as soon as it is ripe. The seed can be rather slow, sometimes taking 18 months to germinate. Transplant out the seedlings into individual pots when they are large enough to handle. Grow them on in a greenhouse or cold frame for their first winter and plant them out in late spring or early summer of the following year. Can also propagate via cuttings or layering. The bark is harvested in the autumn and should not be stored for longer than one year since it quickly loses its medicinal properties. Young thin bark is preferred. Store dried wild cherry bark, cut pieces and dried wild cherry bark, powder in an airtight container in a cool, dry place.